Published: April 08, 2019 17:44 Jyoti Kalsi, Special to Gulf News tabloid! 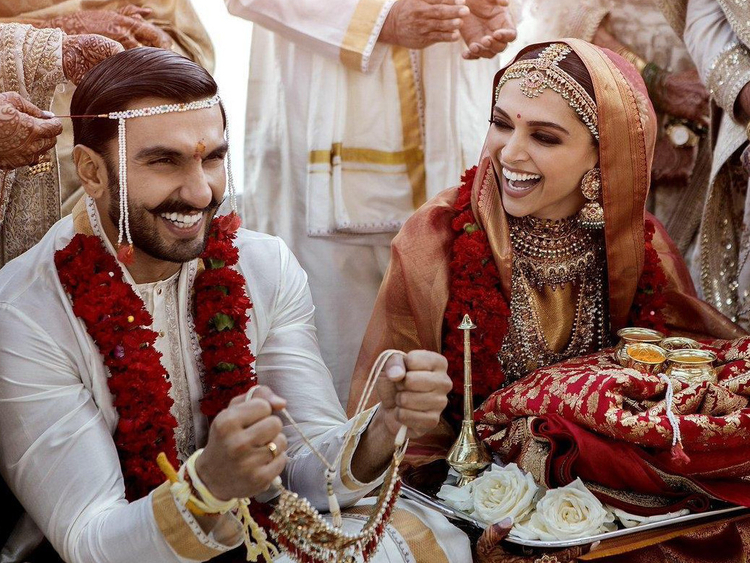 We love to see pictures of celebrity weddings — such as the spectacular celebrations hosted by business magnate Mukesh Ambani in Mumbai for his son Akash Ambani’s wedding — which have redefined the idea of the big fat Indian wedding; and the small, intimate nuptials of Bollywood stars Deepika Padukone and Ranveer Singh in Italy. But we cannot even imagine the planning and work that is required to organise such mega events and destination weddings. Vandana Mohan, founder of The Wedding Design Company (WDC), who designed both the Ambani and Padukone-Singh weddings, was in Dubai recently to attend the Destination Wedding Planners Congress (DWPC) organised by QnA International at Atlantis The Palm. The Ambani family and her team were very open, welcoming and hospitable, which made our work easier. While respecting the privacy of her celebrity clients, she agreed to give us a behind-the-scenes look at how high-profile dream weddings are organised. “When I took on the Ambani wedding I thought I would have to deal with the bureaucratic systems of a big corporation, but I was amazed to see that Mukesh and Nita Ambani were both personally involved in every stage of the process, even though their busy schedules meant that our meetings often started late evening and went on till 4am. Nita Ambani is full of creative ideas and she has a team that is used to organising big events regularly. The Ambani family and her team were very open, welcoming and hospitable, which made our work easier and more enjoyable. The most challenging part of this wedding was the scale of the event and the best part was that I got the opportunity to work with and learn from leading experts in various fields,” Mohan says. Explaining her design process, Mohan says that she believes in setting new trends and never looks back at what has been done before. She uses pictures, mood boards and 3-D models to articulate her ideas and to understand what her clients have visualised. For her son’s wedding Nita Ambani wanted to recreate the sacred historic city of Vrindavan, (where Krishna grew up) but in a modern version set amid the rolling hills of Salzburg and the most beautiful gardens. To bring this dream alive, Mohan worked with various experts ranging from architects and local artisans to floral designers from the US and Italy who created rolling hills, vibrant gardens, and magnificent floral sculptures of peacocks and elephants, and a French company that designed waterfalls. Her core team of 89 worked with over two and half thousand people on the project and a back-end staff of 12,000 people. Besides handling the logistics of so many different teams working together, Mohan also had the challenge of managing a huge venue. 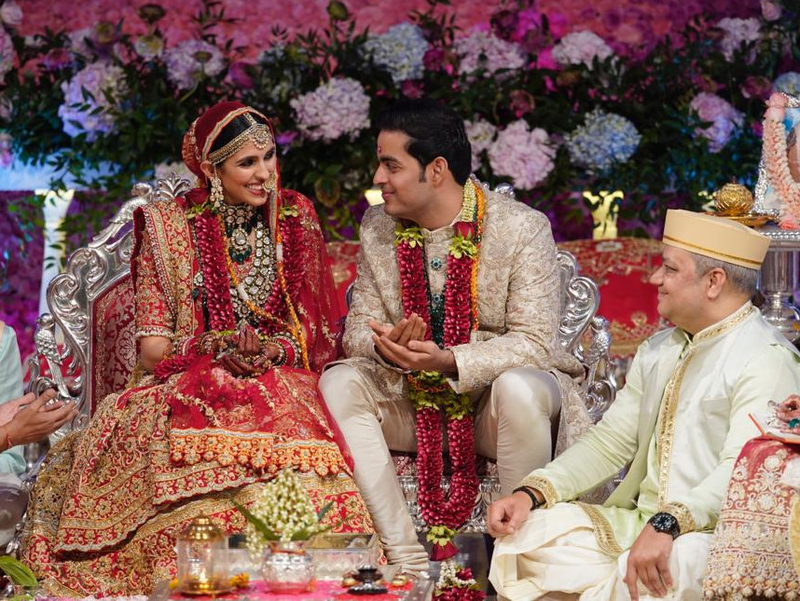 Image Credit: Akash Ambani and Shloka Mehta at their Mumbai wedding in March. “The wedding venue was a convention hall that was so huge that I clocked an average of 22,000 on my Fitbit walking around it every day. For the first two functions there were 3000 guests and for the reception there were 12,000 guests. "While Nita Ambani was involved in every detail of the design and space management, Mukesh Ambani was involved in every aspect of designing the seating and ensured that every seat was a VIP seat with a good view of the stage. "During the reception the Ambani family stood on the stage for six and half hours to greet every guest, with 40 guests coming on the stage every minute. Since guests had to wait for over four hours to get on the stage, we made sure that they were served snacks and refreshments, kept entertained and provided chairs for them to rest without losing their place in the queue,” Mohan says. Surprisingly, while the mega Ambani wedding took less than two months to organise, Mohan spent nine months on the Padukone-Singh wedding. She began by finding the perfect venue on Lake Como in Italy that was accessible only by boat and provided privacy, a beautiful ambience and space for their hundred guests. Besides designing the venue and arranging a Konkani and a Sindhi style wedding ceremony, she also set up an Indian kitchen at the venue with Konkani, Sindhi and other chefs flown in from India and the UK. “Destination weddings have their own challenges, but they are always fun. Both the stars wanted a private wedding where they could relax and enjoy themselves away from the media glare, so we had to be careful to keep the venue and event secret. "Deepika was totally involved in the planning and while we worried about the weather and made Plan B in case of rain, she always thought positively and assured me that the weather would be perfect, which it was. It was lovely to see them relaxed and being themselves — two young people, madly in love and happy to share their special day with their near and dear ones,” she says. “We respect the privacy of all our clients, and I want people to appreciate what I do rather than who I do it for. Over the last 28 years, Mohan has become well-known for organising destination weddings at exotic locations across the world, ranging from Florence, Ibiza and St. Moritz to historic forts and palaces in India. She believes Dubai is a great destination for Indian weddings and is excited that WDC’s exclusive representative in the UAE, Raging Tiger Events has recently signed a Memorandum of Understanding with Dubai’s leading event organiser Dubai World Trade Centre (DWTC), through its experiential arm DXB Live. “We want to promote Dubai as the most preferred wedding destination for Indians, whether they live in India, the UAE or elsewhere. We believe that combining our experience with the expertise, in-depth local knowledge and vast network of DXB Live, and Raging Tiger Events, will help us to achieve this. "I am amazed at the multicultural community here and see Dubai as a stepping stone to the rest of the world. I would love to design destination weddings for Asians and other nationalities living in Dubai, and I also have many new ideas to offer DXB Live’s discerning Emirati clients,” Mohan says. Another Indian wedding designer who has been in the news recently is Devika Narain, who designed the discreet, elegant wedding of Bollywood star Anushka Sharma and cricketer Virat Kohli in Italy last year. She was also in Dubai for the DWPC and shed some light on the planning process behind bespoke Indian weddings. “I trained to be a journalist and interned with CNN before I decided to be a wedding planner, and my training comes in handy while doing the research for the personalised weddings I design. After working for a wedding planner for four years, I decided to start Devika Narain & Co because I wanted to change the way we did weddings. I only do ten weddings a year and spend a lot of time getting to know the bride and groom to design an event that truly reflects their personality,” Narain says. She takes pride in the fact that she works with local artisans to create uniquely Indian spaces. “Indians used to be highly influenced by the images of western weddings they saw on Pinterest and most brides wanted us to copy those. But I wanted to create something that was authentically Indian. 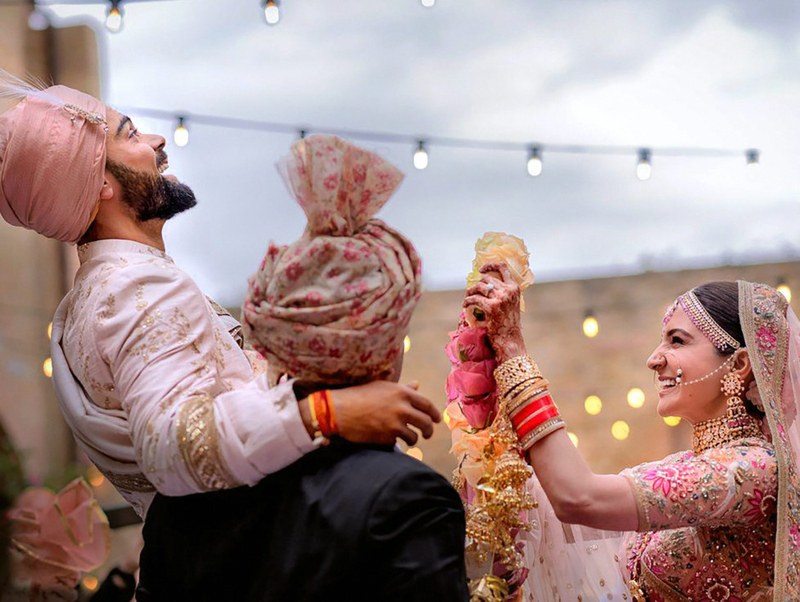 I do not believe in following trends because I think a wedding must be classic, timeless and specific to the couple, and I am fortunate to have clients that appreciate my ideas and aesthetic,” she says.Virat Kohli and Anushka Sharma. Although a wedding planner’s job involves dealing with many pressures and unexpected situations, Narain claims to be an eternal optimist. “I have had my share of disasters such as the pier at a beach resort in Thailand where the wedding was to be held being blown away by a cyclone hours before the ceremony; a fire breaking out in the kitchen just as the wedding procession arrived; and a bride misplacing her wedding outfit just before the ceremony. But we have Plans B to Z for everything and always manage to find a suitable solution,” she says. Narain believes that finding a good venue is half the battle won, although she has accepted the challenge of venues such as a stadium and a parking lot. She loved the beautiful villa in Italy that Kohli and Sharma found for their wedding and enjoyed designing the space. She organised Indian chefs from London along with local Italian chefs to cater to the guests. They managed to keep it a secret and everyone had a great time because no cell-phones were allowed. She thinks it is cute that people wanted to discuss Virat’s bright socks after the wedding images were revealed and refuses to confirm or deny whether the spiritually inclined couple presented their guests with a book of Sufi poems or say anything else about that wedding — and not just because of the non-disclosure agreement she has signed. “We respect the privacy of all our clients, and I want people to appreciate what I do rather than who I do it for. When someone trusts me to deliver on the most important day of their life, I want to make sure that they feel happy and always look back on the day with joy and contentment,” she says.